I have been dealing with my rib injury for nearly two years. I have come to view this injury as a chronic condition, not unlike my asthma. It is with me all the time. It must be managed on a daily basis. Most of the time, the injury lingers in the background, but then when I least expect it, the injury flares up with vigor and I have trouble breathing and the pain level soars. My latest flare up occurred on Labor Day. As part of my long run, I planned to do the Boulder half marathon. I woke up not feeling particularly great, but I warmed up and I seemed fine. A few miles into the race, I struggled to breathe and my ribs started to hurt. I pulled the plug at mile 8 and hitched a ride back home. This was the beginning of a very up and down two weeks. Workouts were sporadic – a brilliant run was followed by a run cut short – leaving me apprehensive about the Twin Cities marathon on October 2. In an effort to calm down my ribs, I stopped swimming, backed off run workouts, and changed my gym routine. I had been doing dry needling, and but now we stepped up the effort with as many as 20 needles in and around the rib cage and diaphragm. Nothing seemed to calm the ribs down. I sought out some new help and found out that I have 4 ribs (9-12) that are hypermobile, meaning that they are moving around too much. This causes the intercostals to stretch too far causing spasms and it also makes the diaphragm incredibly unhappy. Well, that certainly explains the difficulty with breathing! The most hypermobile rib is number 12 which is dubbed a floating rib because it does not attach to the sternum. When this rib moves, it presses on a nerve, which is quite unnerving. Just to keep it interesting, there is also a lot of scar tissue around the ribs. Much of this information is not new. I already knew that there was hypermobility in my ribs, but I did not realize how many ribs are affected, and the explanation of the cascading events that occur when the ribs move too much was enlightening. These are the Graston utensils. There is even one called “The Pointer”. That quote is directly from the Graston website. I really don’t think people are going to rush out and get Graston after reading that. And, guess what? It hurts like hell. Basically, these objects of torment are scraped across the injured area, i.e. my ribs, making a sound akin to nails on the chalkboard. To make sure that you remember the experience for the next few days, it causes bruising. 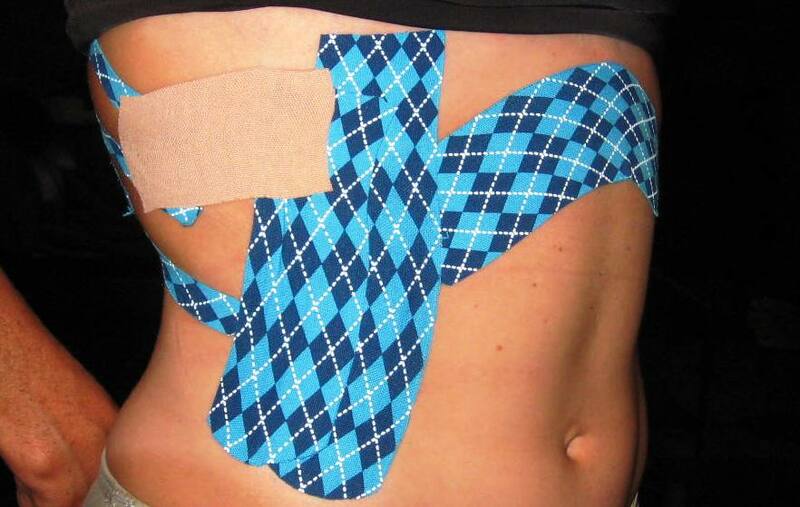 In an effort to stabilize the ribs, a very intricate taping technique has been employed. I had tried taping last year. The tape was magnificent – it stayed on in the pool, workouts, in the shower. It also burned my skin so badly I had red lines on my torso for a month. This time around, my incredibly resourceful father acquired something called barrier wipes that are meant to protect the skin of patients with colostomy bags. I figure if it works for them, it should work for me! So far the taping is working wonders. It really seems to prevent the ribs from moving when they shouldn’t and it is giving much needed support to my rib cage. Of course, in the gym locker room the ladies gasp and give me strange stares and I get the occasional, “What is wrong with you?” I am still trying to think of a better story than, “Uh, I was in a bike crash 2 years ago.” I welcome any suggestions. I realize that tape and fairy dust are not a long term solution. I am still hopeful that a very hot, skilled surgeon with a keen interest in hypermobile ribs will swoop down on a white horse and fix me for good. Yes, here's to the surgeon on the white horse! But this sounds like an illuminating and productive tho' painful month… good luck! Oy I'm getting graston to my calf/achilles…maybe I should also get the taping done to hide the black&blue bruising that follows! Ouch!! Does it really matter whether the surgeon is hot or not? Presumably, you will be unconscious for the procedure itself. Lara, clearly you forgot about the pre and post op visits when I will be wide awake! Previous story Can’t we all just get along? Some thoughts on sharing the road.